Goryokaku Tower Corporation strives to offer impressive experiences, a sense of intellectual fulfillment, comfort, and trust to our visitors as a tourist facility that introduces the history and culture of the national historic site, Goryokaku. Our basic principle is that the employees work as one to always provide sincere service to make economic and cultural contributions to the local community. Shinsuke Nakano establishes Hokkaido Daiwakanko K.K. Goryokaku Tower opens (groundbreaking in April) in celebration of the 100th anniversary of Goryokaku on December 1. Increases the capital from 20 million yen to 40 million yen. Changes the company name to Goryokaku Tower Corporation. Municipal regular tour bus begins operation. The Seikan Tunnel section is added to the second level. Opens a cafeteria and gift shop at the Hokkaido Pioneer Memorial Hall. NHK’s morning serial drama, Kita no Kazoku, goes on air. Acquires the adjoining land on the south of the tower to build a parking lot. Paints the entire exterior of the tower, expands an office, and renovates the gift shop on the first level, cafeteria, and cafe. Records 4 million visitors since its opening. Holds the 15th anniversary event (a celebration party held), Cantata Hakodate Genso. Ryountei begins operation. Builds the front parking, cafeteria on the second level, and renovates and expands the cafe on the third level. Replacement of the elevator hoist. Shinsuke Nakano receives the Hokkaido Industry Contribution Award by Hokkaido. Expands and renovates the first level. Shinsuke Nakano is commended for his distinguished merits by Hakodate City. Records 8 million visitors since its opening. Participates in the Seikan Tunnel Inauguration Expo. Records 9 million visitors since its opening. The 25th anniversary events (Appreciation event, free admission to the observation deck, and celebration party) are held. The Crown Prince pays a visit. Donates a sightseeing patrol car to Hakodate City. Princess Hitachinomiya pays a visit. Acquires land for bus parking. Shinsuke Nakano passes away. Yutaka Nakano assumes the position of President and CEO. The Star-Shaped Cultural Exhibition Hall Opens. Receives the Hokkaido Region Cultural Award Special Award for Corporate Citizen Cultural Award. Expands the tower. Increases the capital from 40 million yen to 110 million yen. Records 15 million visitors since its opening. Renovates the hall on the second level of the tower. Acquires the Matsuoka residence site for parking. Renovates the tower entrance hall and the exhibition hall. The World Bastion Fort Summit is held in Hakodate. Prince Norinomiya pays a visit. Paints the exterior tower. The 35th anniversary project, the memorial speech by Hiroyuki Itsuki, is held. Patriarch Alexy II of Moscow of the Russian Orthodox Church pays a visit. Records 20 million visitors since its opening. Closes the cafeteria division. Yutaka Nakano receives the Hokkaido Industry Contribution Award by Hokkaido. Builds the statue of Toshizo Hijikata. Sets up the bust of Toshizo Hijikata at the observation deck. Receives the Tourism Business Merit Award by the Hakodate International Tourism and Convention Association. Implements the 40th anniversary project. 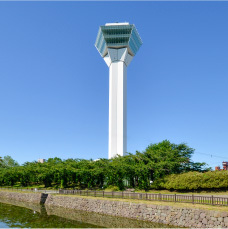 Starts the first-phase construction of the new Goryokaku Tower. Sets up the seated statue of Toshizo Hijikata at the observation deck. December 1: Grand opening of the Goryokaku Tower. The official mascot, Gota-kun, is born. Since the opening of the new tower, it records one million paid visitors to the observation deck in a year. Yutaka Nakano receives the tourism industry merit award by the Hakodate International Tourism and Convention Association. Receives the 13th Hakodate City View Award by Hakodate City. Holds the first anniversary event of the grand opening. Barrel organ completes and is presented to the public. Begins operation from 6 a.m. on the New Year’s Day from this year. Records 25 million paid visitors to the observation deck since its opening in 1964. Yutaka Nakano is commended for his distinguished merits by Hakodate City. The scenery of Goryokaku receives two stars by Michelin Green Guide. Begins the construction of Goryokaku Sakura Interexchange House. Goryokaku Sakura Interexchange House begins operation. Yutaka Nakano becomes the chairman, Hisashi Nakano becomes the president & CEO, and Susumu Nakano becomes the executive director. The 50th anniversary concert by orchestra, Cantata Hakodate Genso, is hosted. In this year, Goryokaku Tower records one million visitors for the first time in ten years since 2006.